Order the catalogue for free – TOP-DESIGN CHWASZCZYNO Sp. J. Fill in the following form, on the e-mail address you will give us we will send the link to the PDF file. We invite you to download our newest company catalogue - edition for 2015/2016 (English and German language). 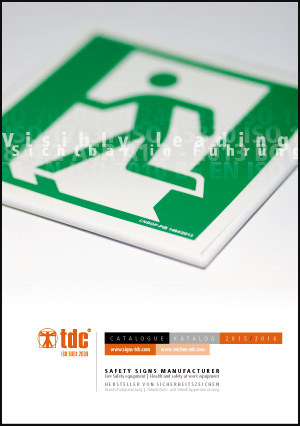 Besides the international offer of our company, which is presented in the English language and the offer intended for German market, TDC catalog contains many novelties, a detailed technical specification of the TDC products, illustrations and a lot of valuable information about their usage. 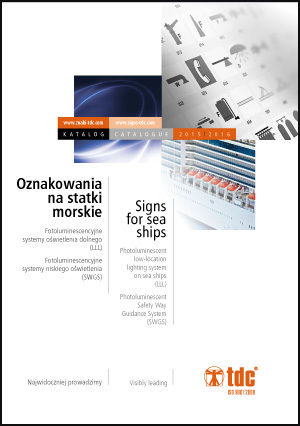 We encourage You to download a catalogue presenting advanced solutions regarding the domain of safety signage intended for marine ships. Among these, we present You i.a. photoluminescent safety signs, Low Location Lighting Systems LLL, low located lighting systems- Safety Way Guidance System SWGS and a number of new solutions concerning marine ships. The catalogue was developed basing on the currently required, in this field, SOLAS conventions, IMO resolutions and international ISO standards.